Word for Today: God has blessed; No man can reverse it. God has blessed; No man can reverse it. 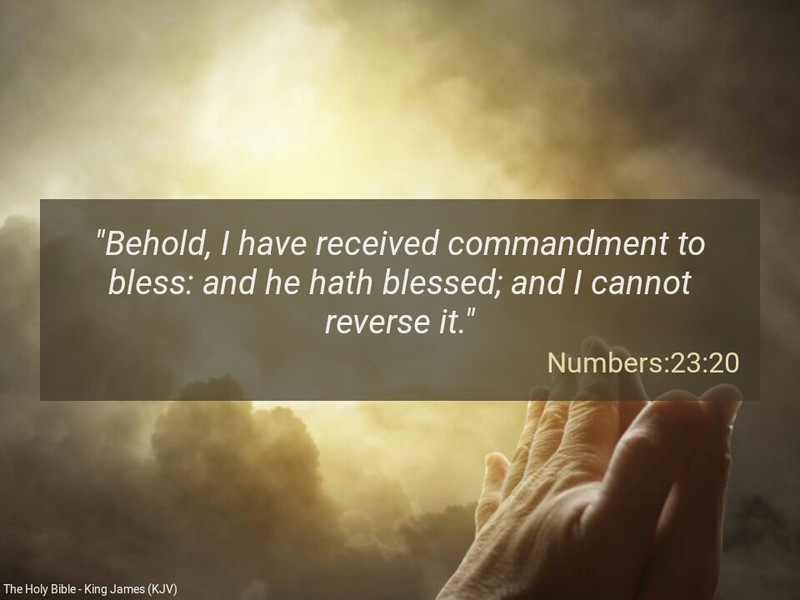 “Behold, I have received commandment to bless: and he hath blessed; and I cannot reverse it” (Numbers 23:30). “God is not a man, that he should lie; neither the son of man, that he should repent: hath he said, and shall he not do it? or hath he spoken, and shall he not make it good?” ( Numbers 23:19). I join my FAITH to everyone sincerely connected to the Ministry of the Word of God and declare that you & your loved ones shall be free indeed in the mighty name of Jesus. Amen. You shall be established in righteousness. I stand in the Presence of the Lord of host, with the authority in His word, and declare that : it is well with everyone reading this message in Jesus name. Amen. It’s well with all your contacts, friends and families. No weapon fashioned against you shall prosper; every plant my Heavenly Father has not planted in you shall be uprooted ; all your challenges and sorrows shall become testimonies; henceforth, you shall weep no more; only tears of joy shall be found in you; all areas of barrenness in your lives are now empowered to be fruitful in Jesus mighty name. Amen. May God answer these prayer points by FIRE in Jesus name. Amen . Thank you Holy Spirit for praying for us when we don’t even know how to pray ( Romans 8:26). The word of God cannot be broken. Every good thing the word of God says about you shall come to pass. You shall fulfil your destinies on earth. Yes, in Christ God has blessed, I cannot reverse it. Dear Father, please bless everyone of us beyond measure as we continue to praise you this season in the mighty name of Jesus . Amen. Previous Previous post: Word for Today: Deliverance, Holiness before Prosperity. Next Next post: Word for Today: The Fourth Man in Fire; the fourth like the Son of God.